What happens when people try to influence the place they will have in history or the place they think is rightfully theirs? What happens when mothers try to influence the mark their children will make on history? Rebecca encouraged the younger twin, Jacob, to obtain both the birthright and his father’s blessing by deceit. These rightfully belonged to his older twin, Esau. However, Rebecca believed that Jacob, the studious brother, should be the one to carry on the blessing passed from Abraham to Isaac and not Esau, the hunter. It is interesting to contemplate what might have happened had she not intervened in the path of history. Esau did not seem to have the qualities appropriate for a forefather of the Jewish people – he was a warrior, lived by his strength and hunted rather than farmed. This means that he was likely in constant motion, unlike the scholarly Jacob, who tended sheep and cultivated crops, a livelihood that allowed him the opportunity to study and develop spiritually. Moreover, Esau had already married two Canaanite women, something that displeased his parents; supposedly a Canaanite woman could not give birth to the emerging new nation dedicated to the One God. (1) Rebecca came from an unscrupulous family who seemed to have traits unworthy of a spiritual people. It was said that anyone who could survive an evil environment and remain pure and kind was especially worthy of bearing progeny that would generate a spiritual people. If Rebecca, from her background, was deemed worthy of mothering the new nation then Canaanite women should be no less worthy, especially since it appears that by the end of King David’s rule, the Canaanites had been absorbed within the Israelite nation in any case. (2) Rebecca showed herself not to be all that far from her deceitful family origins. When “the chips were down” she behaved true to her family of origin culture. What does it mean for us, then, that our destiny was partly set in motion by an elaborately devised scheme that tricked Esau and Isaac and to which Jacob acquiesced? Did Rebecca not have faith that God knew what He was doing? Did she think she had to correct some error in judgement or plan that He made? (3) Sometimes seemingly irresponsible and unworthy people suddenly “wake up” when they are impelled by circumstance to take responsibility. There is no reason to anticipate that Esau would necessarily have been incapable or unworthy of the task of leading the tribe. After all, Esau was the first-born and God knew all that that entailed culturally and we can assume that He did not forget His promise. In addition, Esau’s fighting skills may have provided a distinct advantage to a new people who must show their strength in order to survive. 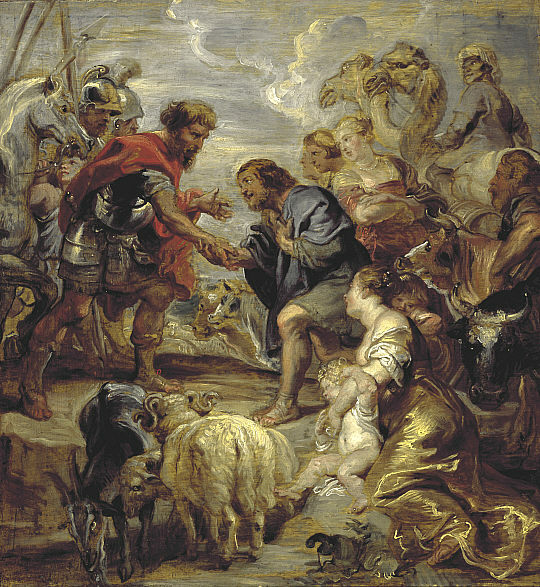 After having realized how he was tricked, and as soon as he learned how much Rebecca and Isaac did not want Jacob to marry outside the tribe, Esau went off to join up with Ishmael’s family. It is not clear if Esau married into Ishmael’s family in order to please his parents or if he did it to form an alliance with a fellow victim of “birthright and blessing” thievery. I don’t believe that the end justifies the means. I don’t think it bode us well that Rebecca plotted the deceit against her husband and elder son in favour of her younger son. That was an unwarranted and dangerous intrusion into the spinning wheels of history. Truly ethical and spiritual people, I think, trust more than was demonstrated by Rebecca. She had no real trust in God if she believed that He could mistakenly bring Esau into the world ahead of Jacob. Imagine how things might have developed had Esau been awarded the birthright and blessing that were truly his. Jacob would not have challenged that – there is nothing in the Bible before this point that leads us in to think he would have been jealous. 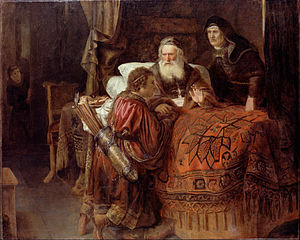 It is more likely that Jacob would have happily served as adviser and supporter for his older brother. Furthermore, we have no reason to doubt that Esau, who did appreciate the fruits of his brother’s fields, would have appreciated any less the fruits of his brother’s scholarship. In such a case, we would have seen a history that included cooperation among brothers rather than competition, hatred and fear. What kind of difference would THAT have made to our growing nationhood and, therefore, to us today? Perhaps a lesson we should take from this is that mothers should appreciate the differences among their children and delight in these differences, encourage the enhancement of these differences as equal and complementary. Because, given these differences, her children as a group are far more than each of them individually could ever be. We may have all lost out because Rebecca was jealous of Esau on behalf of Jacob and, as a mother, isn’t that ridiculous!